Our new commentator, KG, has a bee in his bonnet; in all kindness, let us try to swat it. If I interpret him aright, his line is that to say Jesus was God is not to say that there is a conundrum which led Christians to the articulation of the Trinity, but rather that, understood in the context of Second Temple Judaism, it does not mean what later Christians took it to mean, and that the idea that Jesus is the Deity is a Platonic implant; he has failed to explain how the Jews who followed Jesus and knew nothing of Plato could identify Jesus as God, because he maintains that this does not mean what Christians take it to mean. This fails to explain why the early Christians were persecuted by the Jewish authorities, or why a Pharisee called Saul, when he converted, did not use the arguments KG uses, to stop the authorities persecuting him and others; perhaps Paul, like the rest of us, lacked KG’s knowledge of the Second Temple Judaism in which he had been living, and with which he continued to interact? Ignoring the Saul/Paul problem, KG offers the passage which many Muslims, Messianic Jews and JW’s offer to support their heretical views; as he is shy about telling us which of these he is, let us take the passage he offers and subject it to some exegesis. So what is being said here? Do the words huios ton theon eimi, mean Jesus was not claiming He was God? If so, it is hard to explain verse 39; why did the Jews try to seize him? Perhaps, like the early Christians, they thought he was claiming to be God? They certainly could not have tried to seize him because he was claiming something else; that would make no sense. So, we can see that the Jews here took him to be blaspheming, reading ‘theon’ as ‘God’, not ‘a god’. Unless, of course, the Jews wanted to stone him because they were just feeling that way that day; perhaps, unlike KG, as Second Temple Jews, they understood only too well what Jesus was claiming? The notion that the passage supports the view that Jesus is not claiming to be God does not only not fit with what verse 39 says, it makes verse 30 incomprehensible: ‘ I and My Father are one.” The Shema (Deuteronomu 6:4) teaches that YHWH is one, but in place of YHWH Jesus places himself. Form any orthodox Jewish perspective this was rank blasphemy and merited the penalty of stoning. They picked up stones as the natural reaction to this. The Jews did the same to Saul/Paul. Paul did not turn round and say that that this was all a big misunderstanding, he said Jesus was one with God. The Jews tried to stone him for it, as he had joined in the stoning of Christians for their crime. Or perhaps KG thinks they were picking up stones for some other reason? I shall retirn to this theme, God willing, next week. In a second post on Monday, I shall return to this theme. Indeed. No one is denying that the Jews had a different concept of who and what the Messiah would be, or that someone might wish to read this passage in a different way. 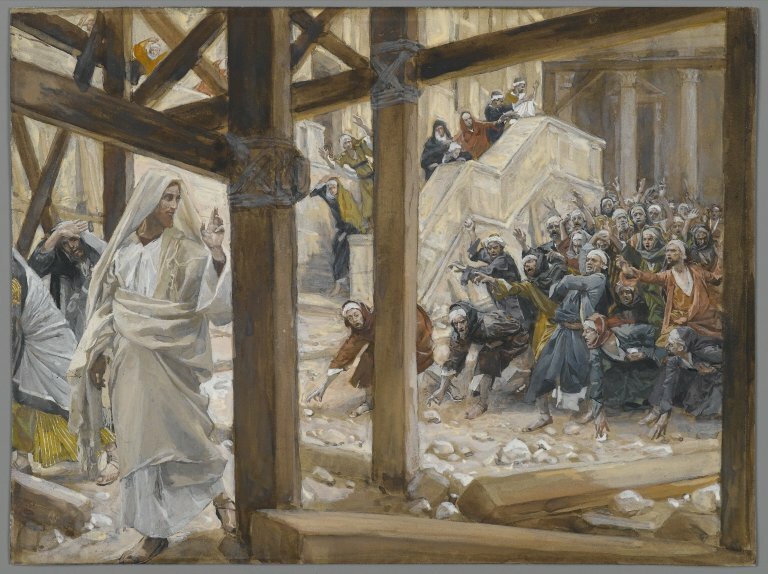 But the Jews who heard it knew what it meant – which was why they tried to stone Jesus, and why they did stone his followers. KG is hung up on the old-fashioned scholarship which dates high Christology late – he should get himself up to speed before throwing stones at Mark. He should indeed, my friend. A good defense made here Geoffrey. Thanks! It cannot be done because the fact is Jesus was clearly claiming divinity here and in other places. It’s a good thing God uses the foolish things of the world to confound the wise then isn’t it? Steady on there Geoff, otherwise me and my big pretentious ideas will come under fire for favouritism again. Now if you were to insert a sneering har-di-har-har after ‘that year’ you would get an idea of what John was getting at. High Priests were appointed for life, from Melchizedek (High Priest/King) through Arron (High Priest) onwards, what John is saying, and what would be understood by the Jewish Christians is that Caiaphas was not a legitimate High Priest because Herod was not a legitimate king, the two went together and as Herod was a place man, so was Caiaphas. John is saying in Jesus the High Priest/King of Melchizedek is restored. So just like today there were those Jews/Early Christians who held to tradition and the fulfilment of the messianic prophesies and those Jews who went along with innovation and invention, and we know what happened to them. Q. Is quoting the Bible plagiarism? A. Yes, if you are addressing KG. Whats so freakin shocking that a hebrew hates Jesus?Havent you heard, Jews rejected their messiah?. They are still waiting for him. I have only skimmed through the comments for the “Jews for Jesus” postings. I note that KG has several times referred to the understanding of divinity in 2nd Temple Judaism that presumably would have authorized the acknowledgement and worship of Jesus as “divine,” yet he has not in fact cited anything from any 2nd Temple sources. I for one would like to see what he in fact is referring to. To equate the veneration of Moses or Elijah with “worship” (as we understand the term, namely, the worship of the only One who is truly divine, everything else being created) seems implausible. Clearly Jesus said and did things that many of his peers judged to be blasphemous, as we see in John 10:22-39. Why would 2nd Temple Jews want to stone Jesus for blasphemy just for saying “I and the Father are one?” Why did they think this was blasphemous? Not that any of this matters, which is the key point. The simple fact is, the categories of 2nd Temple Judaism were incapable of accommodating everything Christians wanted to say about Jesus. Jesus is the new wine that breaks the old skins. As the gospel moved into the Gentile world, it would of course have been easy enough to identify Jesus as a god and thus “divine” in some sense This would have fit right into the pagan understanding of deity. But the Church recognized that they could not do this, without fatally compromising its Jewish monotheism. Nor could it identify Jesus as God the Father, because clearly Jesus distinguished himself from the Father. Hence it took centuries for the Church to create a language by which to confess what it needed to confess about Jesus–and that brings us to the 4th century trinitarian debates and the Nicene confession of Jesus as “of one substance” with the Father. I commend this article by David Yeago: “The New Testament and the Nicene Dogma” (http://goo.gl/vYytj1). Thank you so much, Fr Aidan. Heve you see Professor Hurtado’s post here? This certainly fits with what Goeffrey has written. That certainly does track well with what Geoffrey is writing. GRSS assumes that one thing exists and attempts to fit everything into that paradigm. As a 20th Century Western Protestant, his assumption is that Jewish converts to Christianity were also 20th Century Western Protestants and believed as such. He also assumes they were converts. What does it mean that the Jews who followed Jesus and knew nothing of Plato could identify Jesus as God? What does it mean to identify as God based on the 5000 years of Jewish theology? What would have resonated with the population of the time. After all, these were not converts, these were members of an unbroken tradition that had culminated in the Messiah, and as such carried that tradition with them. What does it mean to be called God in 33 AD Israel? And does it parallel with modern conceptions as well as Platonic Philosophy? People were called Gods, what does it mean? And GRSS has not answered. But this too misses the mark, since the understanding in question is not limited to 2nd Temple Judaism, that is also a mistake, since the conceptualization is hardly limited to any Temple period. We are talking about a belief structure that is actually older than that. I have not “cited anything from any 2nd Temple sources” in part because the issue is hardly restricted to the 2nd Temple period, and since it is hardly my responsibility to explain the derivation of a belief system that is not my own. I can say I know this is being addressed elsewhere, but I doubt anyone here would be familiar with that level of discourse. If you understood what I have been writing, you could have spared yurself most of this. You simply assume, on no knowledge, that despite my reading this through a hermeneutic of revelation, I am reading from a Protestant perpective. This is sad, as for it to be so, Fr Aidan Kimmel, an Orthodox priests, and Professor Hurtado, would also have to be reading it the same way, as we come to thesame conclusion. Now, can you explain why the Jews wanted to stone Jesus? Can you explain why they wanted to stone Paul? Or are you going to continue the one-trick pony line of repeating your mantra that what the Jews clearly understood Jesus to be saying, they could not have thought he wa saying. As for Bosco, if you hadn’t noticed that he has odd opinions which are often picked up, then you are unobservant. You invited yourself here, and part of the Christian community our hostess has created here is to let blatantly poor behaviour speak for itself; it possibly explains why you are still allowed to post here, when you have failed utterly to engage with the argument. Further everyone on this site has tried to identified their school of thought to the community here to assist dialogue. This is not easy as the weakness is that of being totally understood within narrower restrictions than your personal position. However it acts as an introduction and more precise understanding of matters is elicited as interaction progresses. You however have refused to tell us where you are coming. Please do you think you might consider correcting your approach in this. My advice is;……..get yourslfs saved, then look to help a hebrew brother come to know Jesus as his savior. One cant lead someone to Jesus if one himself doesnt know Jesus.